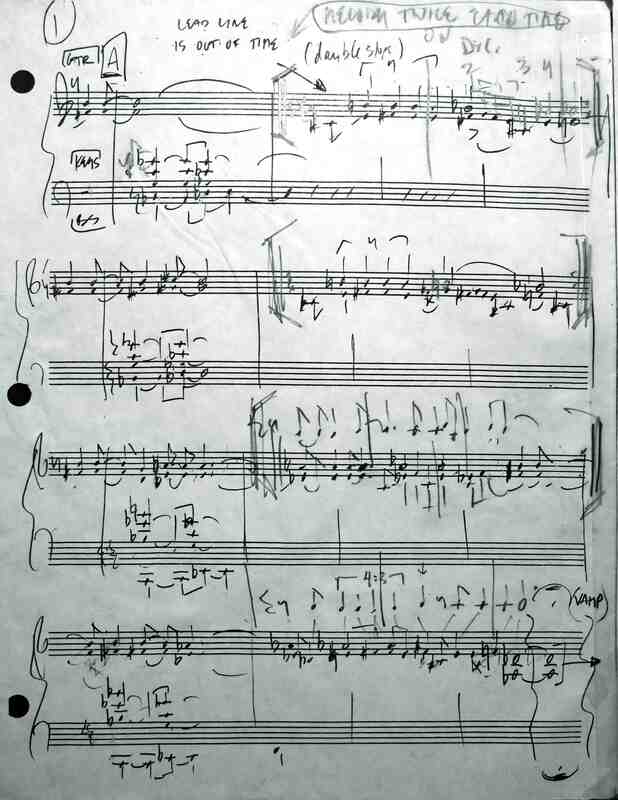 How can a composer control the flow of musical information in a piece that’s improvised? How do you get a group to improvise together without it turning into an out of control free jazz fusion blowing session? Use the best players you know and write from the top down; try to channel Duke Ellington and write for the musical personalities on the band; hone your ideas down to just a few, and spread them around amongst the players. Composers like Sun Ra, Ornette Coleman and even Miles Davis used musical cells, short phrases and gestures as a point of departure for improvisation. This is a “sketch” mode of writing where the composer suggests music, the band supplies the orchestration. This technique requires clear intent by the composer and relies on the openness and creativity of the improvisors. 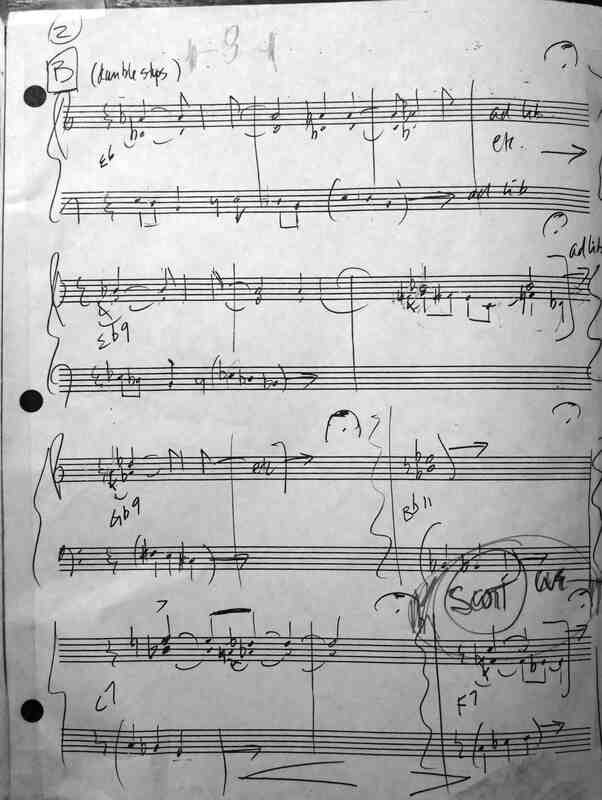 I can’t post others’ copyrighted material here, so I’ll use one of my tunes to show this mode of top-down writing: “c0k3” — from 2006, written for and recorded by The Coalition. I’m playing clavinet, Glenn Alexander is on guitar, Michael Merritt is on bass and Shawn Pelton plays drums and live electronica. Here’s how I think it works: the cells or gestures (can’t really call them ‘melody’, just try to sing along) happen first and influence the direction and placement of the answering figures, and the placement and groove of the rhythm section. The opening phrases are played “out of time,” but with an inner pulse of their own. The sound of the band develops over time, and as things happen, players make choices which effect others’ choices, all within a clearly defined form. Check out letter B where the clavinet and the guitar improvise on the double stop Db-Ab pattern–I wrote “E6” to suggest an overall tonality. I left it up to MM to decide exactly how and where to groove the three note bass patterns. The higher double stop gesture drives the bus, playing in time but also not “in tempo” with the rhythm section. After the first fermata I cue the next system by simply playing the next series of notes. Everyone follows and the tonal center shifts as the tune builds. This goes on for a while until there is a defined solo area with a bar count and chords in more of a traditional style. The melodic cells imply chords and the chords are melodic. When you listen back it seems seamless the way the piece moves from the in-time out-of-tempo ad lib feel into the regulated 4/4 time. 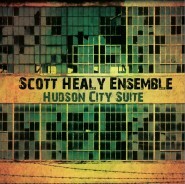 The group improvisation is controlled, defined, melodic and harmonic, but has a cool freedom. I give the credit to the players for making it happen. 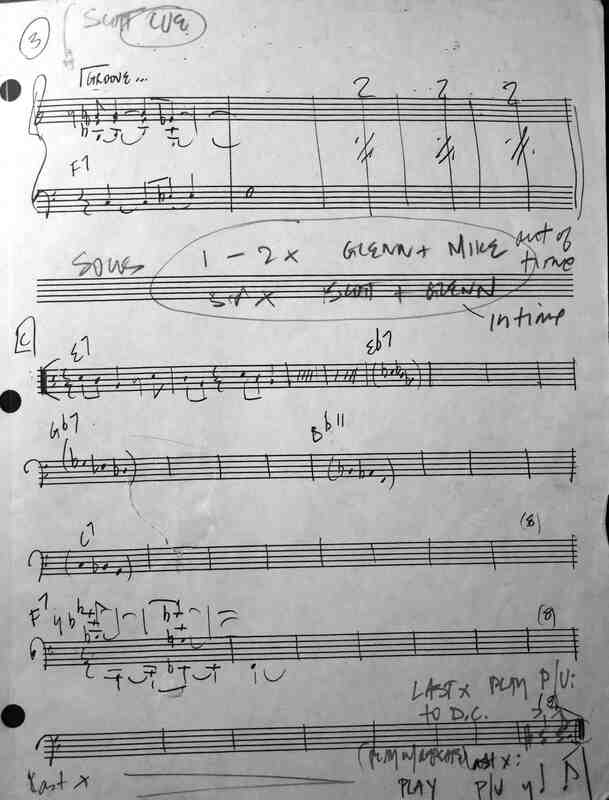 Gallery | This entry was posted in Harmony, Jazz Arranging, Jazz Composition and Analysis, Orchestration, Scoring Free Improv, Theory and Harmony, Top--Down Writing and tagged arranging, clavinet, composition, free jazz, fusion, improvisation, jazz, jazz analysis, jazz arranging, jazz composition, jazz theory, linear harmony, music, music theory, Orchestration, ornette coleman, sun ra. Bookmark the permalink. Thanks for the online lesson and examples of your compositional techniques.Great!!! !